Perth Best Coffee: There are notes in Coffee?? When I first heard the term "Coffee Notes" I initially thought it was about a song.... and in all honesty I am not quite sure if I know now or really care. Coffee to me has many meanings, but the one that I enjoy the most, is when I can escape for a few moments captivated by my own thought sipping that great coffee... or catching up over with some friends you have not seen forever!!! Happy memories really. It was not until I came to Australia from Holland that I started to enjoy my coffee. My father I found out ( I was adopted) sold coffee machines in Holland. So one could argue that genetics has a great deal of influence here and coffee is in my veins. I remember arriving here in 1981, feeling utterly disappointed with the lack of cafe's available. How great it is now to see that we have so many in Perth and that the bar of coffee quality has been raised. Someone told me that Perth has more cafe's per head per capita then anywhere else in the world... Ahhh I am in the right place... SO I guess this thing about the notes of coffee. Does it mean that coffee dances on your tongue as you are indulging yourself in that perfect brew??? And what notes are there when the coffee is bitter and a disappointment to the pallet? SO if coffee have notes what song would they sing??? 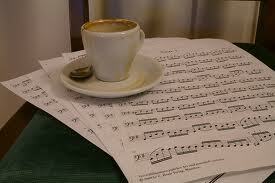 Speaking of songs it is amazing how many songs are about the love for coffee.. The trusted Google returns 165,000,000 results when you type in "Coffee songs" Coffee is and has been an integral part of our lives. Back to these notes... something intriguing about them... what is it really?? There is Acidity... Body... Flavour and Aroma..... and if the four all combine in perfect harmony... mmm that coffee will be something else..... These things are influenced as to where the coffee is grown , handled and stored as well as the roasting process.